Scam SMS messages from Jio DTH on the rise, stealing banking credentials. The scammers are using the rumoured Jio DTH decoder to steal people their important credentials. Reliance Jio 4G network is one of the most commented entities recently in the world of technology. And that is mainly due to one important reason: affordable prices for their services. Jio has been slowly venturing into fields that are not a network service provider. Recently, rumours about Jio's adventure in DTH decoders and the wired network have been circulating on the Internet. The scammers have taken advantage of these rumoured services and have been exploiting Jio's exaggeration to perform cyber crimes. After unearthing an SMS scam promising the rumoured Jio DTH boxes for Rs 11, there is another scam related to the Jio DTH TV and JioPhone going around. We recently received a text message with the following message: " Get “JIO PHONE & DTH Rs. 10 only for lifetime free channels register now offer for 1st 1000 customers avail this offer http://jiodevices.online/ Book now”. Now, the initial impulse for such a lucrative offer is to register for the product immediately before it runs out. 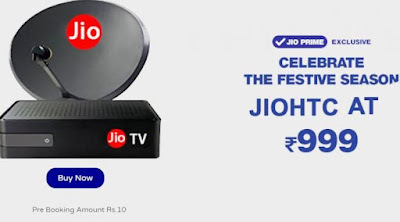 Clicking on the link will take you to a website that can pass as the real Jio website at first glance, with large JioFi banners and a coarse looking Jio DTH decoder decorating the page. Once you click on the book button, it will take you to a paid gateway portal that offers payment through a debit or credit card. The next page in both subsections will ask for your card number, CVV number, expiration date, cardholder's name and date of birth. The banner at the top of the page shows Rs 10 as the amount to be negotiated. However, once you click on the "Make Payment" button, you will be greeted with the following message: "Oops! Transaction rejected by your bank." Even if you perform the entire process one more time, the web page will still show the Same message several times. If you fell in love with the deception and gave all the real details of your bank account, then the information now falls on someone who has malicious intentions. The website does not belong to Reliance Jio and is not even verified by The URL"https://jiodevices.online" does not exist and has been designed to trick users into believing their authenticity. Therefore, it is advisable to be careful with these dubious messages with URLs. One should always keep in mind that the products and services rumoured of a particular organization are never released before the official announcement of the company. The rumoured Jio DTH is not yet a reality and the company will announce it on its official website once the product is launched. If you are interested in buying the Jio DTH box, follow the media to obtain the latest news and information related to it. Search the product or service on the official website. If it appears in the list, it is advisable to follow the links from your own website. A malicious website will present several incorrect elements despite replicating the official site. Therefore, one can expect susceptible-looking products, incorrect logos, grammatical spelling and many others. If you have a computer nearby, look for the link in Google Chrome. If the link does not show 'https' as part of your URL, it is advisable to stay away from that website. Each time you receive an SMS with links to a booking page, you can follow a simple precaution step: complete the data at random in the tables and if the page continues to accept all the information without notifying you of incorrect information, stay safe from such websites.